Stylized photo of Detroit skyline. Promotional video courtesy of Detroit Metro Convention and Visitors Bureau. Book here for group rate. For accessible rooms and details, click here. We'll host the conference in this grandly restored 1924 landmark was once the worlds tallest hotel. Enjoy easy access to restaurants, casinos, and nightlife, as well as Comerica Park and Ford Field. Click for a get-to-know Detroit and Michigan book list, including a selection of Michigan Notable Books from the Library of Michigan. If you have a favorite "Michigan" book to add, let us know. Submissions close: Friday, April 26, 2019. SUBMIT SOON! Want to participate in sponsored sessions? Learn about Proceedings. Log in and then submit your full paper by July 1. Find past conference Proceedings on the ABC Publications page. Proceedings ? - Contact Leigh Ann Whittle, Chair, Proceedings Editorial Review Board. Registration opens near May 1. The C. R. Anderson Foundation Silent Auction held at the ABC annual international conference is a great way to involve our graduate students. Auction proceeds will go towards supporting our graduate students travel grants. Check back later to tell us what you are bringing to the auction or to donate. Awards Banquet - The evening will have awards presentations by our Executive Director and time for conversation. Detroit Metro Airport is a Delta hub. Bus from airport (accessible) to near hotel. Area map. 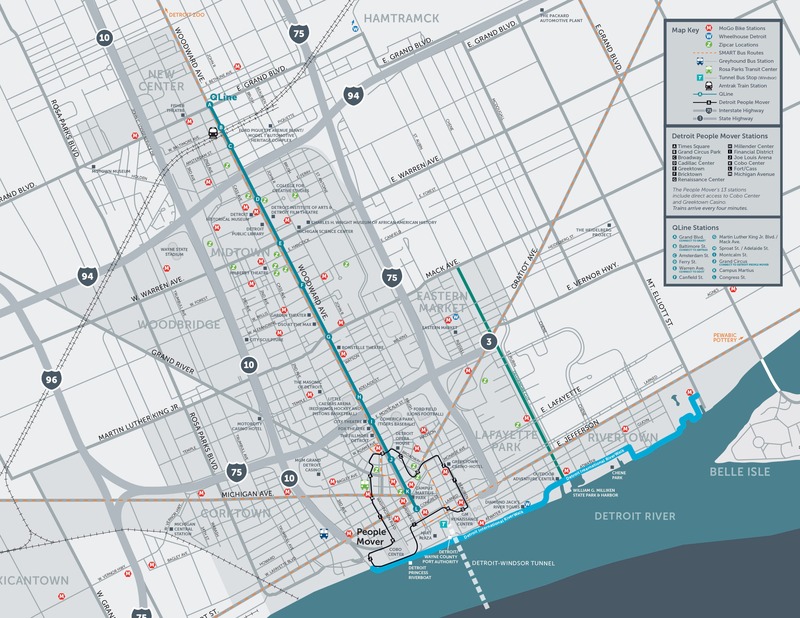 Jump on the Q-line at Campus Martius (a couple blocks from hotel) to find shops, attractions, & eateries along this 3.3 mile streetcar circuit. Metro Cars offers travel via fully accessible van (about $69+tip) or by sedan to the conference venue. Book online or dial 800-456-1701. Metro Cars app available for your mobile device. Taxis are about $50 (not counting any unexpected traffic. This information is shared for user convenience. ABC does not intend to endorse or recommend a particular vendor. Motor City...Motown...Hockeytown...Detroit's homegrown musicians include Aretha Franklin, Diana Ross, Eminem, Big Sean, Madonna, Ted Nugent, and Smokey Robinson. Beloved teams include the Detroit Tigers, Red Wings, Lions, and Pistons. Game night has fans with a Detroit coney dog in one hand and a craft drink in the other hand. Want to share lodging or transportation? Use this member's only forum to connect with others.